When do you need aliases? Sometimes you want to use one table for several different links and only your user's query can define which link you want to use to build a correct query. To build such links you need to use aliases. Let's see the following example. You want to have links like Table1.FieldA → Table2.FieldC and Table1.FieldB → Table2.FieldC You have a database that contains the information about people migration within the United States. There are tables People and States in your database. StateFrom field contains 2 letter state abbreviation of the state where the person from, and StateLives contains the state abbreviation of the state where the person lives now. State table contains StateID - this 2 letter key and StateName - long state name. 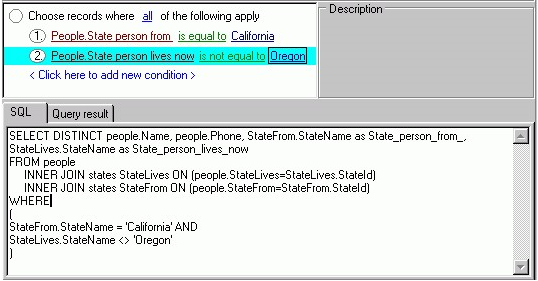 “State person lives now” - corresponds to StateName field from States table with StateLives alias. Here we ask for the people who have arrived from California and do not live in Oregon now.